Heirloom Master: Executive chef Forrest Parker reworks Southern heritage crops into plates for modern palates. 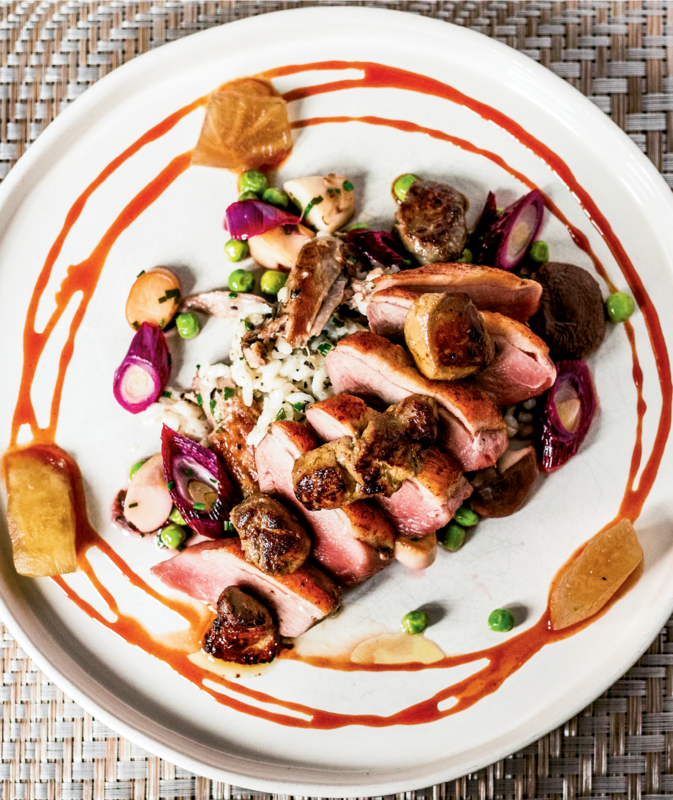 ART OF THE PLATE: Buttery duck breast is seared on an iron skillet and served with Nostrale rice, foie gras, vegetables, and Bradford watermelon molasses. 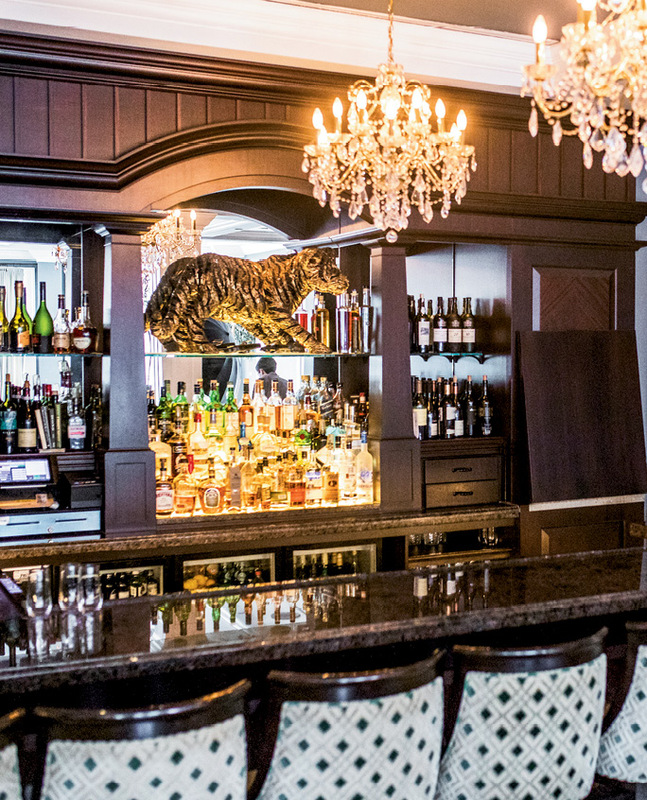 canvasses hang throughout the dining room, while a golden tiger commands attention at the bar. 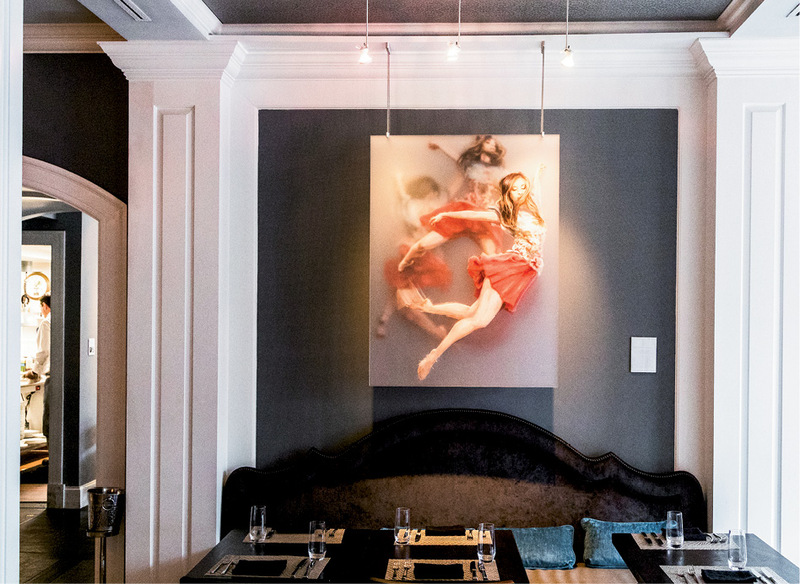 At The Vendue, reimagined as a boutique art hotel in 2014, the current exhibition, “Homage,” culls pieces by 30 artists who were asked to pay tribute to past works, people, and places that inspired them. Similarly, the hotel’s restaurant, aptly named Drawing Room, feels at once historical and modern. 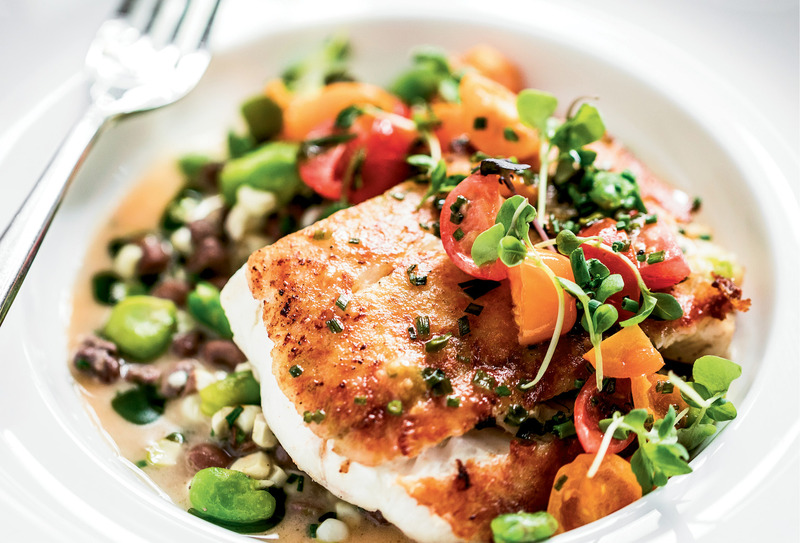 The dining room itself would be quite at home in Paris’s Sixth Arrondissement—which is appropriate, considering The Vendue’s roots in downtown Charleston’s French Quarter. Tufted chairs and banquettes are juxtaposed with dazzling crystal chandeliers and Halogen lights to establish an intimate and refined space, while the bar offers a cozy spot for signature cocktails. As traditional art is reimagined for the modern eye here, head chef Forrest Parker likewise reworks classic ingredients into his menu. An Anderson native, Parker was schooled in classical studies of ancient Rome and Greece at College of Charleston. He later bolstered his academic repertoire with classes at Stanford University’s business incubator program, Harvard University’s Science and Cooking lecture series, and the Culinary Institute of America at Greystone. 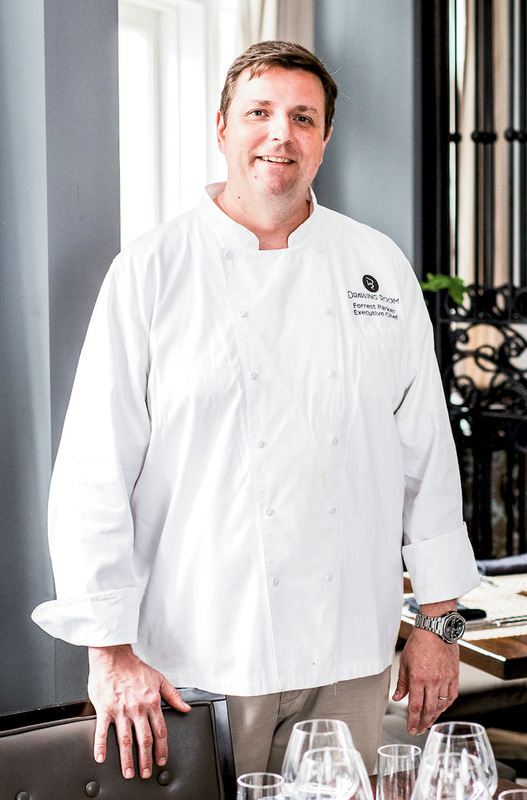 In 2016, he was named a South Carolina Chef Ambassador. Also a licensed tour guide, Parker cheekily refers to himself as the “chief culinary evangelist for the Lowcountry of South Carolina.” His mission: to reveal the history of the Holy City through food. Aligning with the “Homage” exhibit, Parker has been inspired by the Southern cooking traditions of acclaimed regional chefs. While in college, he sought part-time work in the kitchen of Louis’s Charleston Grill in the Omni Hotel (now Belmond Charleston Place), where he found a mentor in Louis Osteen. Later, he learned from chefs Elizabeth Terry, Frank Stitt, and Mark Militello (all recipients of the James Beard Foundation Best Chef: Southeast award), as well as Robert Carter of the now-shuttered Barony Tavern. Parker’s penchant for history is evident in his cooking. Something of a modern-day Jefferson, he maps ingredients by genus and species, with help from his “personal Lewis and Clarks,” including Dr. David Shields of the University of South Carolina, Glenn Roberts of Anson Mills, and Greg Johnsman of Geechie Boy Mill. He researches rice varieties, ancient grains, and rare crops. In his own atelier at Drawing Room, Parker demonstrates that eating demands respect for agriculture, both past and present. 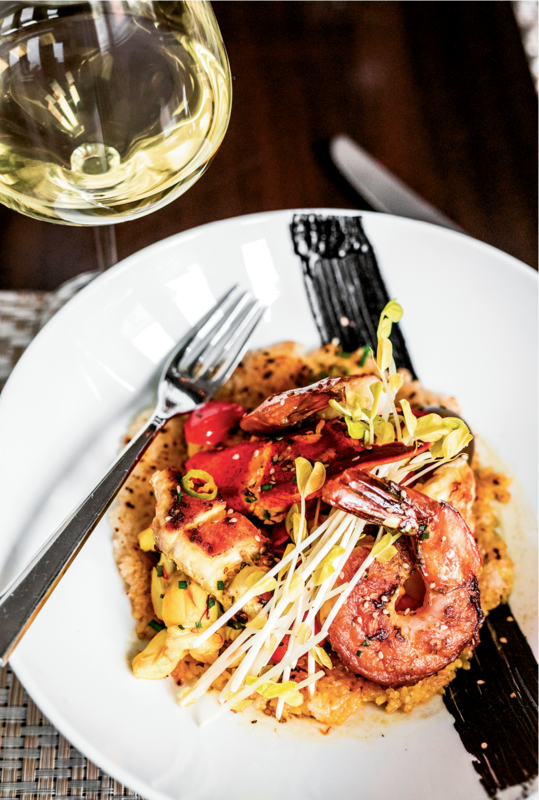 His menu displays a harvest of Southern heritage, including native chestnut polenta, Seashore black rye, Carolina Gold rice, Nostrale rice, Carolina African runner peanuts, Mepkin Abbey mushrooms, and Sea Island white flint corn. Bradford watermelon rinds punctuate cowpea relish, while “Palmetto” hearts and citrus suprêmes brighten salads. But the pantry here is global as well, honoring The Vendue’s legacy as a wharf and warehouse in the 18th century. Parker piles coastal shrimp, crab, and white grouper atop pirlou laced with squid ink-stained aioli. Smoked onion soubise; tandoori butter; gremolata of Brussels sprouts; and sauces of Bordelaise, Diane, and persillade frame his dishes. Small plates quell the hunger of arriving guests: a playful twist on a ham on rye sandwich layers Seashore black rye gnocchi on a frico of aged gouda cheese with country ham and a zesty mustard vinaigrette, while the “Just Wicked” cheeseburger simply satisfies. The soup of the day, a refined asparagus bisque sourced from Jules Arthur Harder’s 1885 The Physiology of Taste, restores and refreshes. Entrees are harmonious combinations, colored by vibrant hues of plants and the sheen of freshly caught fish. A crudo of vegetables circle ceviche, while seared scallops glisten on a canvas of nutty fregola pasta and smoked onion soubise. Mahogany-grilled lamb chops, braised pork shank osso buco, and umber-grilled beef tenderloin parlay their mineral natures with the umami tastes of mushrooms, potatoes, and wilted bitter greens. Savory success aside, if there is a flaw to Parker’s culinary chops, it is over-salting. The rice cooking times should also be tamed, so as not to breach the grains’ integrity. Desserts here are steeped with memory. 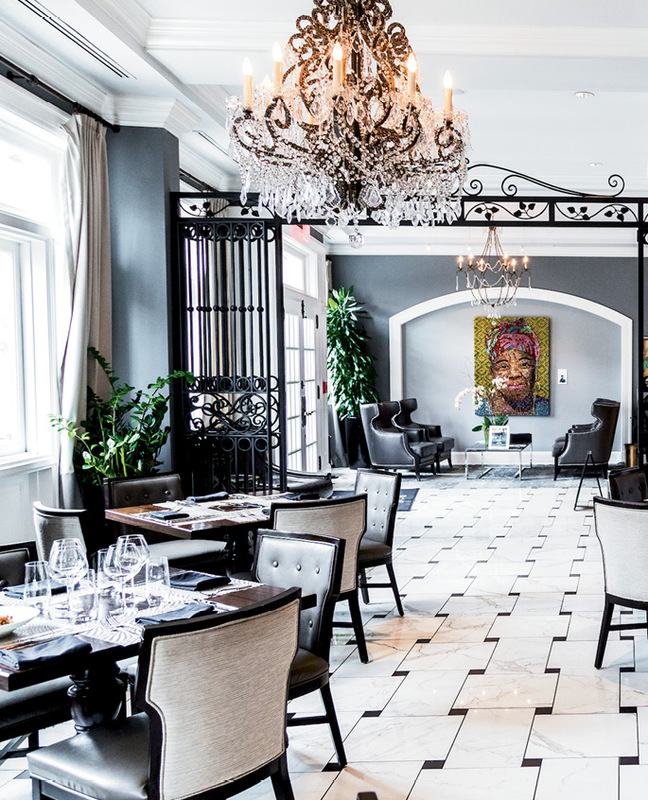 The kitchen serves Southern classics such as Huguenot torte and banana pudding, while buttermilk gelato with toasted popcorn feeds summer whimsy. Classic camping s’mores are elevated with spheres of bittersweet chocolate and marshmallow ice cream, shored on a bed of toasted graham cracker crumbs. The plate is finished with a film of caramelized marshmallow crust. Or pass on dessert and end your meal with an icy limoncello—a surcee from mixologist Nolan Kennedy, who pairs each dish on the menu with a wine. Sitting at the bar, Picasso’s words may come to mind: “Inspiration exists, but it has to find you working.” You can rest assured that Parker and his team are. The Draw: Heirloom ingredients, carefully purveyed and prepared, focus a culinary lens on Lowcountry foodways. The Drawback: The check can easily escalate into triple digits for two guests.